The Punalu’u sensor (and, of course Alex’s frequent onsite reports), along with radar give us great confidence for heading to Kahana, and it’s usually a great success if the sensor readings predict it to be, but Makapu’u is still often a mystery. The Bellows sensor only reports once per hour and with some delay. The Kailua sensor can be helpful on some days, but on the lighter days it is subject to a different microclimate and so may not reflect what’s happening at da Pu. The weather sensors installed and maintained by WeatherFlow (aka windalert, iwindsurf, ikitesurf, sailflow) such as we have at Kahana, Mokuleia, Kailua, and near Waimea, provide wind lull, average, and gust reports every 5 minutes. You can view the data via their website or a phone app. You can also have it send you alerts by text or email. With such frequent onsite data, you get a sense of how gusty it is, if the direction is stable, etc. I have found it invaluable over my 30 years of windsurfing, and it is hugely valuable to my paragliding – except for that giant hole of data for Makapu’u! John and I have long wanted a sensor there, and now that he has a little more time on his hands, we’ve got some momentum on the effort. We (the club) could just try to install our own sensor somewhere, pay for cellular access, and try to maintain it. Anybody who’s been around awhile knows that didn’t work out in the past. John and I believe a professionally backed station like the WeatherFlow system will be better received by the few landowners we may be able to engage. The WeatherFlow weather stations are research grade: self-sufficient with solar-power and cellular communications to up-channel their data to the WeatherFlow data system. 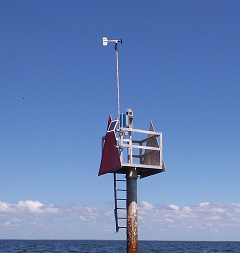 Their standard unit gathers professional-grade anemometer, thermometer, and pressure measurements. Combined, these inputs are the data source for our wind speed, direction, air temperature, and pressure readings that are typical of their web sites. WeatherFlow then downloads to the individualized web sites ( iKitesurf, I Windsurf, SailFlow, FishWeather and WindAlert). Their phone app and website also pull together other info such as various forecast models in many nice graphical formats, NWS discussion, tides, sun/moonrise/set, and historical data and statistics. In consultation with Maui Doug and Dave Goto, John has identified four possible locations. They are: HPU Fence Line, existing wind sock location, the lighthouse, and the Makai Research Pier. Each of these potential sites have good attributes, and have differing challenges to approval. For this reason, John will be meeting with site contacts individually to discuss their potential for a WeatherFlow station. Feel free to offer your opinions and let’s debate the options in the LZ debrief sessions or give us a call or email. WeatherFlow has this special signup for their service pertaining to this effort. Folks who become a member thru that special link won't be charged until the new sensor goes in (if it ever does). So they effectively will get some free time (probably several months at least) to use the service. They just have to be willing to commit for a year's paid service (~$120 or ~$10/month) but since they will likely get several months for free, their true monthly cost will effectively be less! And if we don't get enough new folks signed up to convince WeatherFlow to install the sensor, then the folks who gave it shot got free service! Do ya feel lucky? The site says: "Signing up here indicates your support for the Makapu'u Beach installation project. Your credit card will not be billed until this sensor installation project is complete." Prefer a sensor at Diamond Head? WeatherFlow (i.e. ikitesurf) was considering installing a new sensor there, but didn’t get any interest, so let them know you’d sign up for wind data there. That is a great project and one that is probably long overdue, remember Stalkers sensor at Makai Pier?. The fenceline by the LZ seems like my first choice because of its location. Makai Pier would be great as well and I know John has connections. The lighthouse, which would provide some great wind data, would probably be difficult logistically to get permission to put up a sensor. I have been a Weatherflow member for years, so they don't have much to gain from me, but I am all for it. Until then I can fill you in on how I extrapolate Makapuu conditions from the current sensors. 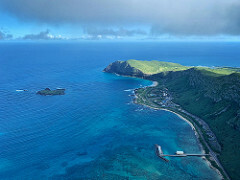 Wind direction: The same wind speed from a different direction changes conditions a lot at Makapuu. Example: 10 mph from the ENE is light and fine to launch from everywhere, whereas 10 mph NNE is strong and blasting through the gap at Makapuu, more like 20+ at Manics. Generally, I think the tandems, little gliders and RD, fly in anything from Bellows average 18 mph and down from a typical ENE day. Big gliders are more like 14 mph average and less. Wind direction: Bellows wind speed high and Kailua low means East at Makapuu, inversely when Bellows sensor drops and Kailua jumps up then things are more north, and stronger at Makapuu. But always check the Honolulu airport sensor, because it can be 12-14 mph on Bellows and Kailua, but 20 mph at the airport, then it is usually one of those days that gets stronger as you climb. Rain is a funny thing, Makapuu will be sunny and dry, while just around the corner in Waimanalo and Kailua the rain never stops falling. This occurs more often then most people think. Makapuu is kind of a squall dodger, squalls approach out front and then get steered right or left by the topography. Or just be like Maui Doug, he says anytime it is green or better on the forecast then he plans on flying.